The soil on Mars may be suitable for cultivating food crops – this is the prognosis of a study by plant ecologist Wieger Wamelink of Wageningen UR. This would prove highly practical if we ever decide to send people on a one-way trip to the red planet. After all, if we are going to live anywhere in outer space in the future Mars stands a good chance of being the place. 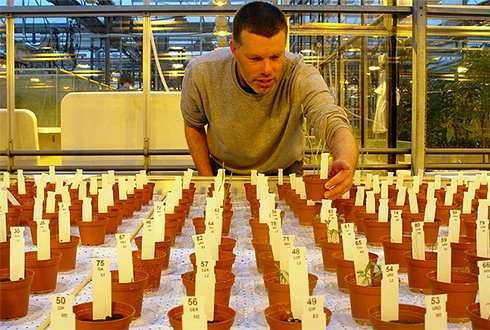 In a unique pilot experiment Wieger tested the growth of 14 plant varieties on artificial Mars soil over 50 days. NASA composed the soil based on the volcanic soil of Hawaii. To his surprise, the plants grew well; some even blossomed. "I had expected the germination process to work, but I thought the plants would die due to a lack of nutrients," Wieger explains. The soil analysis showed, however, that Mars soil contains more nutrients than expected. In addition to phosphorus and iron oxides, the scientist found nitrogen, an essential plant nutrient. Professor Leo Marcelis of Wageningen University is advisor in the 'Mars One' project and one of Wieger Wamelink's colleagues. He is looking into cultivation systems that should make growing vegetables on Mars possible. "As it is impossible to take everything from earth, we will need to produce food if we want to go into space. This requires knowledge on cultivation systems that function well in Mars conditions," says Leo. According to the scientist, it is a huge challenge to install such a life support system on Mars. One aspect of plant cultivation is the soil, but there are plenty more challenges on the red planet. The low gravity, for instance, creates problems with the water supply as it makes it difficult for water to run downwards. The low gravity also means there are issues with the exchange of gases by the plant such as carbon dioxide and oxygen. This causes them to grow slower and evaporate less water. Additionally, Mars hardly has any atmosphere, the temperatures are low and there is much less light than on earth. On Mars plants would be cultivated in enclosed plant growth facilities', possibly equipped with LED lamps. But which colour is best for plant growth and where would the electricity come from? As Leo points out, many of these issues are linked to current research at Wageningen UR. His plan is to test one of these cultivation systems for Mars on earth. "It involves a total system design," Leo adds. "In addition to controlled cultivation systems, complete recycling will also be essential on Mars. Wageningen UR has plenty of expertise in both fields." According to the scientists, the research has a lot of potential and will provide a wealth of knowledge which may also be applicable here on earth. Research into the cultivation of plants in difficult conditions is not only relevant to future inhabitants of Mars, but also to those who wish to remain on the blue planet. Wieger: 'Mars soil consists of volcanic rock. If we learn to bring it into cultivation, we can use the knowledge to cultivate crops on difficult soils here on earth." Insights into a more effective recycling of water, gas and nutrients and the closing of cycles are also possible. The development of high-tech automated and optimised cultivation systems, sensors that continuously monitor the needs of plants, and plant cultivation in low light conditions are also an important spin-off of the project. Wieger and Leo believe that residing on Mars will only be feasible if you can achieve the basic condition of food production. It is much cheaper than sending food from earth and good for the psychology of those living on Mars. "I am convinced that Wageningen UR can develop a complete food cultivation system for Mars within ten years," Wieger concludes. "Knowledge of complete controllable cultivation systems, plant varieties related to soils, food security, and entomology for bee pollination are all areas Wageningen UR has in-house. So if we are asked to develop cultivation systems for Mars, we can make a flying start." It's impossible to take everything, but bringing food does not seem to be the most difficult challenge. Assuming a human being needs 500g of dehydrated food everyday, and that's probably a high estimate, a yearly stock would weigth about 180kg. So you could easily feed a crew of five astronauts for one year with only one ton of dehydrated food. Make it three tons and you can probably send food on a regular basis, considering the launch windows to mars. It would be interesting to have Wieger Wamelink comment on the book "The Martian" by Andy Weir, in which the stranded astronaut grows potatoes on Mars using soil from Earth and his own "fertilizer". What plants were grown in this project? Curious if this experiment factored in the earth's magnetic field. Was this somehow blocked to assure that these plants would grow without it? Since... it won't be there on Mars. Additionally, if the top photo to the story is accurate, then it appears at least some of this growing was done in a glass/greenhouse environment that would allow the photoelectric effect to work as normal through the earth's atmosphere.